HOLY CRAPERS! I AM IN LOVVVVVVE! Cute… but unless it sounds REALLY good (doubtful) this should be priced around $50, not $150. This is so cute! But I have to agree with Mark, it’s probably not worth $150. I love the european-ness of it… but agreed, if it were $50, only then would it be a must.. 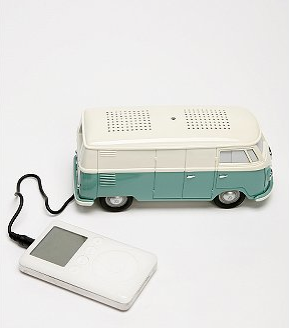 I used to have a VW bus that would play a vinyl Lp – it would drive around in circles and stay on the grooves. Same color.